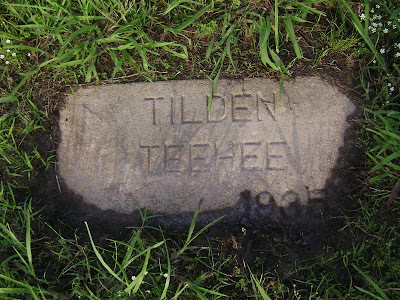 Tilden Tehee was born about 1871 in Cherokee Nation, Indian Territory to Yu-che-tee and Susie. In 1880, he was listed on the orphan roll in Cooweescoowee District as Tilden Hayes and living with Rat Sanders. Tehee married Annie Henson and had a daughter named Rosabelle. Tehee died July 9, 1935, the victim of a homicide. He was originally buried in the old Fisher Cemetery. When the Corps of Engineers put in Fort Gibson Dam, the cemetery was moved and now he rests in the new location of the Fisher Cemetery along with many of his friends and fellow Cherokees. News article from the Ada Evening News; Ada, Oklahoma; Sunday, July 14, 1935; p. 2. (AP) — Murder charges were filed here today against Stanton Skeen and Levi Peyton, alleging that they kicked and beat to death Tilton Tehee, 63-year-old Cherokee Indian, in a fight nine miles north of here last Tuesday. nieces of the dead Indian, Luella Henson, 17, and Lillie Pumpkin, 20, witnesses to the fight, testified at the inquest through an interpreter. Information obtained from Guion Miller application #9427 and Dawes applications #9334 and #2066. Luella Henson was my greatgrandmother! Stute was her caretaker or father. Do you have any info in their lineage? My family are all members of the tribe but would be great to track and make a book for the family especially Luella's children and so forth. Yes, I have quite a bit of info you might be interested in. Please feel free to contact me through the "Contact Me" link in the right side bar of the blog! I will be happy to share what I have with you.